Celebrities are people too. People with shocking pasts, identity changes, and secret side jobs, apparently. Scroll through to check out the facts you won’t forget—from the creepy place Kim Kardashian had her birthday party to the astonishing item Shailene Woodley doesn’t own. Olivia Wilde was technically a princess for a short while. She was married to an Italian prince named Tao Ruspoli. Dakota and Elle Fanning both go by their middle names. Dakota’s real first name is Hannah, and Elle’s is Mary. Cara Delevingne’s grandmother was lady-in-waiting to Princess Margaret, and Joan Collins is her godmother. Ryan Gosling and Sandra Bullock dated for a year in 2001. He claims it was one of the best relationships of his life thus far, along with Rachel McAdams. Kate Bosworth was formerly an equestrian champion. She now teaches disabled children how to ride horses. Taylor Swift has written a 350-page novel, but it has not been published. Jennifer Garner was not allowed to wear a bikini or make-up until the age of 16. Kristen Stewart is originally blonde, and only dyed her hair for the role of Bella in Twilight. Shailene Woodley does not have a permanent home or cell phone. Victoria Beckham collects crystals and places them around her home and office to create positive energy. Beyoncé is allergic to perfume, despite the fact that she has her own fragrance line. Natalie Portman’s real name is Natalie Hershlag. Kim Kardashian had her 14th birthday party at Neverland Ranch. Jennifer Lawrence earned her SAG card for a commercial for MTV’s My Super Sweet Sixteen, where she parodies the show’s spoiled rich kids. Watch the video here! Gwenyth Paltrow's godfather is Steven Spielberg. Speilberg is also Drew Barrymore's godfather! Jessica Alba graduated high school at 16 years old. Vera Wang is Emmy Rossum’s aunt. Gwen Stefani has only ever had two boyfriends in her entire life: No Doubt band mate Tony Kanal and husband Gavin Rossdale. Sienna Miller, Emma Roberts, and Olivia Wilde (along with countless other celebs) have all starred in Abercrombie campaigns. Jennifer Aniston’s real name is actually Jennifer Anatassakis. 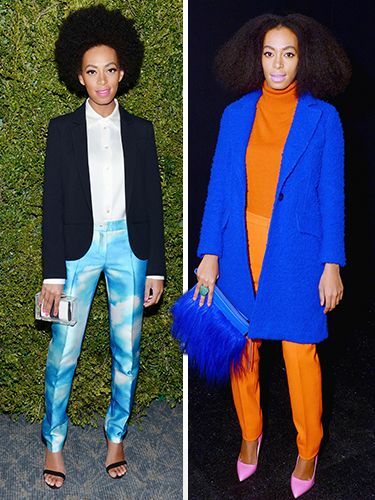 Solange Knowles is the songwriter behind some of older sis, Beyonce’s, hits. Selena Gomez got her start on Barney when she was seven years old, along with Demi Lovato. Anna Wintour has sported her signature bob since she was 14 years old. If you do the math, that’s the same hairstyle for 50 years! Lauren Conrad has sworn off wearing a bikini in public. Which fact did you find most shocking? Let us know in the comments below!